The Raven Remastered is ranked in the 41st percentile of games scored on OpenCritic. Wanna play and chill? The Raven Remastered is there for you. The Raven: Remastered is a great point-and-click adventure game with an enticing story which will have you hooked through all it's twists and surprises right until the final scene. The soundtrack and voice acting are easily on-par with a certain Belgian detective's films and TV shows, with each actor coming across as genuine and believable and you're always rooting for and hating the people the game intentionally wants you too. I'm hoping we see more from both THQ Nordic and KING Art Games Games moving forward as they clearly love what they do and are masters of the genre. Can't recommend enough to fans of murder mysteries, point-and-click, and adventure games. The Raven Remastered tells a clever tale of one man attempting to find a well known thief. A story that keeps you on the edge of your seat is hugely important to point and click adventures such as The Raven Remastered. And thanks to its clever writing and mostly believable voice acting, it manages to accomplish that. 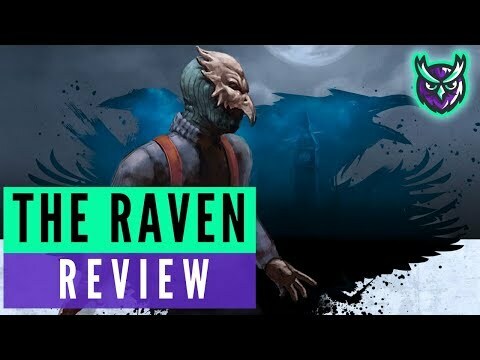 Overall, the riveting plot of The Raven will keep you hooked right to the very end if you can look past the strange character models and don't mind spending more time reading and listening than actually playing. The Raven Remastered is a welcome return for a point-and-click adventure that pays homage to classics such as Monkey Island and Broken Sword. This renewed edition adds the support of 4K gaming along with a very interesting plot, that will let you experience a mysterious story from the perspective of different characters. I started The Raven Remastered with a bit of a soured opinion. Here was this game I had never heard of getting a remaster, it looks like an original Pixar attempt at making human features, and the dialogue is cheesier than the Power Rangers reruns my sons enjoy. I'm so glad I didn't rely upon first impressions, because like Constable Zellner, the game is deeper than it looks and has a story that will keep players guessing. I couldn't ask for much more in a great whodunnit. The Raven Remastered is still a game with a good story, but outdated visuals, clunky animations and sometimes boring dialogues prevent it from reaching an higher score. A good remastering of a game belonging to a genre of the past. The story is worth following, the characters worth knowing and the clues worth finding. It’s only the execution that let this game down. Gotta fix up the gameplay a bit to get the big scores. Is a remaster of an average adventure game really necessary? If you did not play original, you can try it. Explore a thrilling crime story.